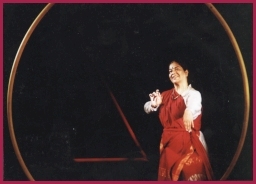 USHA GANGULI (Kolkata) a Sangeet Akademi awardee, leading the theatre group Rangakarmee for nearly twenty-five years now, remains essentially an actress who loves to take on challenging roles and seek to grow in the process. Trained as a dancer in the classical Indian modes, she strikes the delicate balance between formal rhythm and reality in the raw. Rangakarmee, which had its inception in January 1976, spear heads the Hindi theatre in Kolkata today, with fourteen productions on its live repertoire. of concern never betraying her into facile realism or sentimentality.